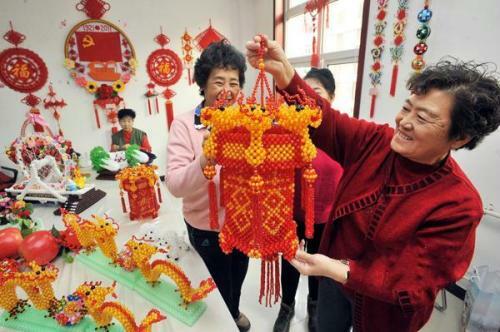 At the New Spring Handmade Art Exhibition held by the Jianchangdao Street Women's Handwoven Association in Hebei District, Tianjin, more than 200 exquisite hand-made pieces including beading, crocheting, and Chinese knots were displayed to residents. These works were carefully created by the weaving experts in the community. The works such as Beaded Dragon Lantern, Ssangyong Play Bead and Three-dimensional Chinese Knot of Fortune Frog all appeared for the first time. "I've compiled five different laps. How are you doing, Liu sister?" "We're moving about the same speed." More than 30 women were busy working in the Jianchangdao Street Women's Weaving Association in Hebei. In a recent exchange activity organized by the Municipal Taiwan Affairs Office, they received an order for 300 â€œLucky Frogsâ€ sold to Taiwan. Lu Min, deputy head of the association, said that compared to previous orders for wedding ceremonies or opening of stores, this was a â€œbig saleâ€. Even more gratifying is that the compatriots in Taiwan can appreciate the hand-woven fabrics in Tianjin. Door culture. According to reports, in Taiwanese local language pronunciation, "Lucky Frog" and "Lucky Fat" are pronounced similarly, and because of their beautiful meaning, the small "Lucky Frog" is very popular with the local people. On the eve of the â€œMarch 8thâ€ Womenâ€™s Day last year, some skillful technical experts from Jianchangdao Street, Hebei, and laid-off, retired women who liked hand-weaving were gathered together. With the help of the Hebei Womenâ€™s Federation, the Jianchangdao Street was organized and handcrafted by women. The Knitting Association is mainly engaged in Chinese knots, hand-knitting, bead weaving, and related products. It has conducted a series of training activities such as Chinese knots, beading, and crocheting. It has successively produced a wealthy frog, a financial source, the eyes of Tianjin, Chunhua Qiushi, and crystal pendants. Other varieties. Yu Fengying, 62, is a key member of the hand-knitting association. Her beading is her unique skill. After she retired, she stayed at home and joined a hand-knitting association under the guidance of a friend. Yan Fengying, who has always been fond of the Tianjin Eye Ferris Wheel, decided to create a Ferris Wheel himself. For this reason, she went to the scene five times to carry out â€œfield investigations.â€ With the help of the associationâ€™s sisters, it lasted two times. It cost more than 9,000 beads in a month and finally produced a finished product. At present, this work has applied for participation in the women's hand-knitted work appearance design competition organized by the City Women's Federation. "The sisters in the association have helped me a lot. A lot of tricks and inspirations have been drawn from our interaction with each other." Feng Fengying said.